The Warwick Hotel, in Huntington, Indiana, burned to the ground on October 13th, 1904 killing 302 people. The strange occurrences involving the Warwick family and the 13th floor of the building leading up to the fire still plague the reconstructed hotel. Reconstructed on its original site, this legendary real-life haunted hotel famous for supernatural happenings and a macabre history. Can you survive your stay on the 13th floor? Reginald Warwick couldn’t. 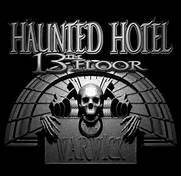 The Haunted Hotel-13th Floor is one of the BEST haunts in the area. You’re greeted by Eldon the bellhop, your guide into the hotel and its infamous 13th Floor. Do enjoy your stay but be careful… the residents here are lonely. They don’t get many visitors and miss the companionship you and I take for granted. They may not want you to leave. But not to worry, I promise they will take good care of you. Welcome to the Warwick Hotel. We love a haunt that is more than just one haunted house. One fabulous haunted house can be great, but there is a lot to be said for a collection of haunts scattered across one park so you can fill a whole evening with screams. Darksyde Acres offers six sinister haunts to spike the Michigan night with terror. Hollywood-quality effects and professional actors more than earn this park its spot on our list. The haunted hayride is a traditional favorite for this time of year. Darksyde earns extra points from us for bringing the delightful terror of the season to the younger generation. Starting in 2012, the scream park includes a haunted hayride designed for families. Introduce your little ones to Halloween horror in a way that won’t land them in therapy for the rest of their lives. Once this mile of spooky fun is over, however, the little ones should get tucked in with a kiss and hopes for sweet dreams before you venture forward into our own personal nightmare. Wander through the rest of the haunts prepared to fight for your own survival. The zombie hordes have taken over the farmland and are eagerly recruiting more for their number. Join the army fighting off the impending swarm of undead armed only with paintball guns. Escape the land-crawlers and you must battle the rotting crew of Michigan’s only haunted pirate ship. Encounter Captain Karcass and his bloody bride along with their decrepit crew for a haunted house that will make you wish you could walk the plank just to escape the torment. Zombies are the hot trend in haunted houses, but we love that Darksyde Acres has taken this idea and put a salty twist on it with the pirate haunted house. We were also overjoyed to hear about the family friendly hayride. There’s nothing like getting together with the whole clan for Halloween thrills. 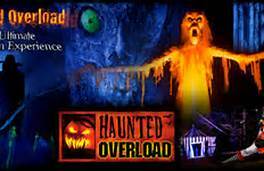 Located in Wasilla, Alaska, this Halloween haunted attraction has been scaring their guests since 2007. Gateway to Darkness is the creation of husband and wife team, who found a common bond in their love of being scared. The duo first decided to try putting on their very own haunt by transforming their two-car garage into a Halloween graveyard and found that they loved the experience. Soon the couple began to travel to Halloween haunted attraction conventions and toured over 30 commercial haunts throughout the United States. 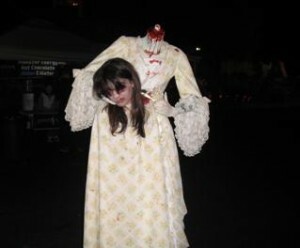 With all of the makeup tips, costumes, props, and special effects they picked up in their travels, their home haunt quickly grew in size and attracted over 1,500 guests in 2006. For the next year, they decided to take their creation the commercial route and Gateway to Darkness was born. The haunt was opened in Wasilla and is housed in a Quonset hut, which also hosts the Wasilla Splatterhouse Paintball (an indoor/outdoor paintball field) outside the Halloween season. From all accounts, Gateway to Darkness was an immediate success and has been drawing in more victims each year. Billed as “Alaska’s most professional Haunted Attraction,” the theme of the attraction is to take their guests into their own private horror movie. 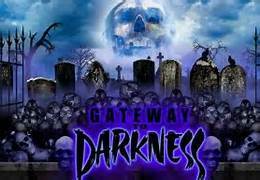 Gateway to Darkness is specifically geared towards the teenage and adult crowds, and they even recommend that the haunt is not for children under 12. New England is known for its quiet towns and close-knit communities. With Nightmare New England, however, we learned that appearances can often be deceiving. This scream park invites victims to take a stroll through a sweet New Hampshire community that went terribly wrong many years ago. We love a good evil family story, and this one certainly didn’t let us down. The legacy of the Bishop family sticks with its victims long after they escape the expansive park. You have heard the whispers about the Bishop family. They were outcasts, separated from the rest of the community, and kept at a distance because of their strange ways. When over 2 dozen people went missing over the course of several years, suspicion turned on the family. The Bishops were gathered up and tossed into jail. The unusual sounds and screams haven’t stopped coming from the home, however, and new evidence has released the surviving Bishops from jail. They have settled into Brigham Manor, their old home, and you are invited to come for a visit. Stroll their hallways and see if you can solve the mystery of the missing. If you make it out of the house you will find yourself in Ravens Claw cemetery. Wind your way through the tombstones and gaping graves deep in the woods, hoping you get past the corpses and creatures who roam the grounds. Slip out of the cemetery and find your way to Riverside Hospital. This small hospital has been transformed into a psychiatric unit to take care of those who wander onto the grounds of the Bishop home and are changed in ghastly ways. Hold on to your glow stick tightly. It is the only thing that will illuminate your group’s way as you move through the infested hallways. The Bishops are said to have infiltrated the hospital and horrific things are happening there. Have your explorations made you curious about the origins of the Bishops? Venture further into the woods and brave a visit to The Colony. Here an even darker family secret resides. When your maddening climb up the Bishops’ rotted family tree has finally come to an end you are welcome to explore the Monster Midway. Games, food, and music await you in the fearsome festive atmosphere. Be wary, though, the carnival isn’t safe from the gruesome monsters who call the woods their home. This victim’s choice for pure creepiness and story continuity may not have made it onto the Top 31, but we wouldn’t take its terror factor for granted. Late in the 1800s there was a quiet town in Tennessee called Hamblen County. Here is where the Lexer family called home. Jeremiah Lexer was a quiet man, a pillar of the community who had no issue with any of his neighbors or the law enforcement of the town. At least, this is what everyone thought until the day in 1902 when they stepped into his home to find it splattered with blood, his family slaughtered, and Jeremiah dead by his own hand. The town chose to keep the morbid affair quiet, but as the years passed, the grounds were gradually excavated. Bits and pieces of at least 30 bodies were discovered scattered among the buildings and across the grounds. Now, 111 years later, the estate of Jeremiah Lexer has been transformed into Frightmare Manor. This is unlike any haunted house we have added to our list. Here the victims are still being found and visitors are literally walking on the blood of the dozens cut down in the horror house. Four real-life haunts await modern day victims brave enough to step into the dark reality of a serial killer’s home. Frightmare Manor looks like a quaint farmhouse, but the moment you approach the door you realize you are not coming for a cordial visit. All around you are reminders of the Lexer family. Many of the items in the home have remained untouched since 1902, including the burned-out fireplaces and axe marks in the walls. Look closely and you just may notice scribbles along the walls—reminders of the grandchildren who once played in those cursed hallways. Step carefully as you climb the stairs Jeremiah did on the way to his demise. Remind yourself as you go that the house is filled with secret chutes he designed for the purpose of sending his victims into the basement. Once out of the house, move on to Frightmare Chaos. The original structure was destroyed, but this recreation was built to the exacting specifications of Jeremiah’s original blueprints. You will notice the walls are stark white, a bold contrast to the splatters of blood. This was Jeremiah’s own plan. He loved the look of blood against the white and craved the patterns it created as he tortured and experimented on his victims. If you can bear any more, follow the final path of Jeremiah’s victims to find yourself in Frightmre Necropolis. This valley of death in the back corner of the farm land is where the majority of the victims were discovered. Cut to pieces, the victims were scattered among buildings and left to confound and confuse those who are still uncovering them. A final attraction awaits you if you have the strength. This challenge forces you to come face to face with your fears and gives you the opportunity to show your courage in front of friends and other victims. This victim’s choice haunt is so much more than a haunted house. Rare is the opportunity to roam amongst the belongings of a real serial killer and walk in the footsteps of those whose blood soaks the ground. Frightmare Manor earned its place on our list for pure terror and eerie reality. The dark, isolated feeling of the Oklahoma countryside is the perfect setting for any number of horrific experiences. The quiet of the open space and the incredible depth of the darkness can send chills down the spine of anyone, even the bravest of haunt veterans. 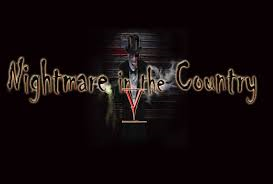 Nightmare in the Country brings you into the deepest depths of a 5 acre farm for 6 intense attractions that will steal your image of the peaceful family farm forever. There was a time when Nightmare in the Country offered a hayride through the nearly half mile of terror saturated grounds. This, however, was too peaceful a journey. Now you are left on foot to roam the trails and hope you can find your way out before the creatures claim you. During your trek you will encounter Weepingville, a ghost town that does not take the term lightly. On the outskirts of this town you may stumble into the Cemetery of Chills where some of the gruesome inhabitants of Weepingville have left their bodies and others are still creeping through the graves. It is not only the victims of accidents from the nearby Mine of Misery or those who didn’t make it out of the Asylum alive that you have to fear as you try to make your way back to sanity. A toxic waste accident has made Oklahoma a bio-hazard zone. The entire area is silent, but in the blackness creep those who only made it out partially alive. Fight the undead to regain your life. We love the multi-faceted character of Nightmare in the Country. The 6 haunted houses keep a continuous stream of the same story, but bring you into completely different surroundings with each haunt you visit. Having to trust your own feet is something entirely different than a haunted hayride and we are passionate about how the terror increases with each shaky step you take through the seemingly unending, monster-infested darkness. This is a Victim’s Choice for in-your-face, immersive horror. Clowns are one of those horrors we are used to seeing in haunted houses. We see them so much we just kind of anticipate them in most of the haunts. So when we saw “Freakling Brothers Horror Show” we figured it was just going to be more clowns. We were in for a delightful surprise. While you will encounter plenty of clowns in your adventure through the scariest show on earth, there are more monsters, more creatures, and more truly maddening experiences lurking just beyond every dark step. The Freakling Brothers Horror Show is the first haunt in Nevada to offer a Rated R experience. In this particular haunt you are not safe from the hands of the actors and you must be prepared for all of your senses to be assaulted. The old saying says that everybody loves a circus. Well, it seems the Freakling Brothers went truly mad dedicating themselves to pushing the envelope and bringing new and innovative experiences to their shows. Kidnapping disturbed, mutated, and horrifying monsters from the darkest corners of Europe, the Brothers dragged them back to be a part of their Circus of Horrors. If you survive your audience with these three rings of torment, escape into Castle of the Vampyre. Evil lurks in the dark corridors of this dilapidated mansion and it is up to you to find your way out. If you still have a grasp on any of your sanity, prepare for your descent through the Gates of Hell. This Rated R haunted house is the first of its kind in Nevada. Before you are permitted to enter the haunt, you are required to sign a release. This task complete, you are invited to experience your own violent, tortuous death. The cold darkness presses in around you as you descend toward the depths of Hell to meet Satan himself. You are not a passive witness here. Prepare to become a part of the show as the monsters reach for you, their fingers grasping and clawing at you as you move blindly through the maze. Freakling Brothers is a haunt like no other. New for 2013 is an incredibly intense, innovative experience that has never been attempted before. Called The Victim Experience, this add-on is offered to only 5 people each night. These victims are sent through the Gates of Hell maze last, and then their torture begins. Participants are warned to be prepared to stay for a while and to wear something they don’t mind having destroyed. The Brothers keep pushing the envelope, paying more attention to pure, brutal terror than to elaborate scenery or expensive technology. When we used to think of Lancaster, Pennsylvania the first thing that came to mind was rolling fields of corn and quiet, devout communities. This was before we heard of Field of Screams. Rounding out our Top 25, this intense haunt is a victim’s choice for uniqueness and pure saturation of mind-bending horror. Though the premise of the four attractions may sound similar to other haunts, it is the degree of detail and dedication that pushes this haunt to the next level. The haunted hayride is a time-honored Halloween festivity, and this is one of the first to be born. Step onto one of the custom-made wagons and prepare for a 20-minute ride through a darkened cornfield saturated in blood and macabre wonder. Here you come upon the twisted inhabitants of the farm, maniacal clowns, and indescribable creatures who have crept from toxic waste. When your joyride has ended, step inside the Den of Darkness for a bit of hospitality. This sagging three-story home had many lives as a farm house, a hotel, and a mansion estate. Each incarnation, however, shared a grisly feature. Explore carefully through the dusty, spider web-encrusted hallways or you may discover the source of the gruesome splatters on the walls and the dank smell in the air. Are you ready for escape? Try to run, but choose your path wisely because the Nocturnal Wasteland is just outside. Along this haunted trail you will encounter the darkest and most damaged of those who call Field of Screams home. Far more than a haunted house, this trail puts you on foot in the inky blackness of the woods. As you try to find your way out the members of an exclusive, murderous community of monsters is hunting for you. Has the fear pushed you over the edge of your sanity? Venture over to the Frightmare Asylum. They are dying for you to check in. You can become one of the truly twisted patients who roam the four floors of patient rooms, but be careful. The doctors and nurses have their own disturbing agenda and you may have the next appointment in the autopsy room. The four haunts at Field of Screams have been counted as victims’ choice haunted houses for several years. These extreme attractions combine sound, smell, and sight for a truly overwhelming, terrifying experience. Even those waiting in line aren’t safe as creatures swarm the grounds hoping to keep their visitors for themselves. 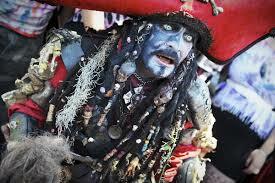 Pirates of Emerson…Terror From the High Seas We have built up a passion for haunted theme parks. One amazing haunted house is fabulous, but walking into a haunted wonderland is even better. Pirates of Emerson in California has become an infamous haunt due to its unique premise and stunning imagery. The haunt began as a creepy endeavor in a backyard and has developed over the years into a terrifying quest on the high seas. 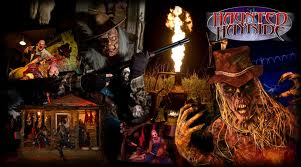 In more recent years the haunt has expanded to a truly impressive haunted theme park, featuring 6 individual experiences. Your exploration includes both indoor and outdoor experiences that test your courage against a range of monsters as well as the most frightening force of all…your own mind. The dark waves of the sea have heaved up their most grisly of hidden secrets…the rotting corpses and angry spirits of a legion of pirates. If you dare step into their lair you should be aware that they are ready to recruit more into their number and they are happy to give you the most gruesome of initiations. Don’t think you are safe when you make it back to dry land, however. Fear Beneath the Pier is waiting on the other end of the plank. Test yourself against the darkest recesses of your own mind in the Mental Maze. Getting sleepy? We recommended Hotel Hell, the quaint little stop on the edge of nowhere. A total of 6 haunted attractions let you fill an evening with screams and seafaring torment. One of the things we love about the Pirates of Emerson is that victims are treated just to the haunted houses. These haunts are accompanied by the CarnEvil, a fright-filled midway offering games, shows, and live entertainment. The intricate sets and committed actors give each haunt its own isolated thrill. As you drive down the dark lonely road toward Overload’s location at Coppal House Farm you know you’re not in for just a haunted house experience but you’re in for something special. You will be welcomed by a friendly staff and then, after purchasing your tickets, led to a massive cornfield where you could find the headless horseman, if you’re lucky. As you worm your way through the cornfield you will become acquainted with unnatural sounds and sights, as well as many interesting creatures. The maze will then thrust you into Pumpkin Alley, a long straightaway filled with all kinds of glorious sights, such as hay bales, torches, and evil tree sentinels. The amazing carved pumpkins are filled with real candles that cast eerie shadows as you walk. Then it’s off to the dark world of Overload. Glowing skeletons, vile creatures, and tortured souls are just some of the wonderful sights that will make your senses dance. The tunnels and mazes are filled with madmen, the undead, and a creature that will chase you with a chainsaw! Have fun, stay safe, and happy hauntings.